Hendon's little Church Farmhouse Museum has been getting some attention lately; sadly, because it is feared it may be closed down. Barnet Council announced not very long ago that it proposes to stop all funding for the museum from 1 April. No decision has been made yet, a final recommendation is expected this month. More information is available on Barnet Council's website. The friends of the museum are running an online petition to present to the council, which can be signed here. I've been to Church Farmhouse Museum several times over the last years, and would find it sad to see it go. 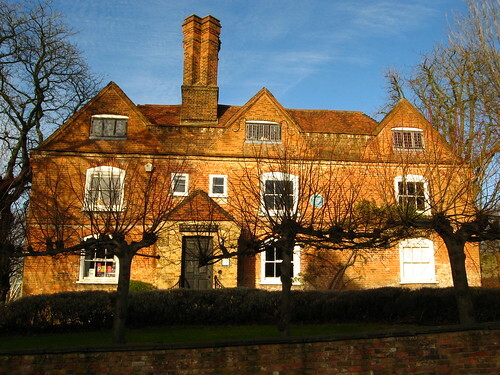 The building, originally Church Farm, is one of the oldest surviving dwelling houses in the borough of Barnet, dating from about 1660. Church Farm, which got its name from the close-by St Mary’s church, was a dairy and hay making farm until the first half of the previous century. In 1955 it was opened as a museum by the local council. The museum is furnished as a Middlesex farmhouse, featuring three period rooms – the kitchen, the scullery and the dining room, which are furnished as they would have been in the early to mid-19th century. Each December, the dining room is decorated for a Victorian Christmas. In addition, the museum has regular, unique exhibitions throughout the year as well as an ongoing exhibition of 20th century toys and games. It also has a small shop, which is selling local history publications, cards and toys. Most recently, I visited the museum to see an exhibition on the Phoenix Cinema in East Finchley, and would now like to go back to see the new exhibition on Harry Beck and the London tube map, which is scheduled to run until the end of March... after which the museum's future currently is unclear. The museum is situated in Greyhound Hill, Hendon, NW4 4JR; walk there from Hendon tube in 10 to 15 minutes, or take a bus from there to Church End. Admission is free; the museum is closed on Fridays.